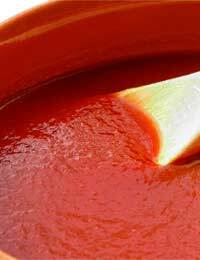 How Should We Freeze or Store Sauces? Home > Ask Our Experts > How Should We Freeze or Store Sauces? When we get home from work we do not always feel like cooking from scratch. Is it possible to make large quantities of sauces e.g. cheese, tomato, sweet and sour etc. and store in jars or freeze to use at a later date? PIZZA TOPPING: Just defrost and spread 1-2tbsp directly onto a prepared pizza base (for 2). TURN IT INTO CURRY: Soften an onion with 2tbsp Madras or Balti paste (we like Patak’s). Stir in meat, vegetables or quorn, and once they’ve coloured, add some of the tomato sauce plus a splash of water. Simmer until the meat or vegetables are done and sprinkle with chopped coriander to serve. PASTA BAKE: Stir the sauce through cooked pasta shapes, add some chopped veg (frozen sweetcorn, spring onions, bottled artichokes, baby spinach, or peas) and cover generously with cheese. Bake until golden and sizzling. Cheese sauce isn’t such a great contender for freezing, as it sometimes splits once defrosted. You can avoid this by adding cornflour to the roux (use ½ tbsp cornflour, 1tbsp flour and 1 ½ tbsp butter). Defrost your sauce thoroughly (in the fridge overnight if possible) before cooking with it. If it splits, a brisk stir should amalgamate the sauce again. Rich sauces like plum, chutney and sweet & sour can also be frozen in individual portions, but if your freezer is full, it’s also possible to bottle these. In order to preserve the sauce, you’ll need the correct quantity of vinegar and sugar, which makes the end result very rich. You’ll find plum sauce recipes available on the internet – use it sparingly to dress a stir-fry for a quick meal.